Move over #selfies, customized animated emojis are the newest social craze with the launch of WeChat’s latest app, MojiMe now available to download for Android and iOS users in Indonesia, Malaysia, Taiwan, Singapore, Thailand, Hong Kong, India, Philippines, South Africa, Italy, China and US users. Just take a picture of yourself or with a friend and select from dozens of fun character themes to place your face(s) into. 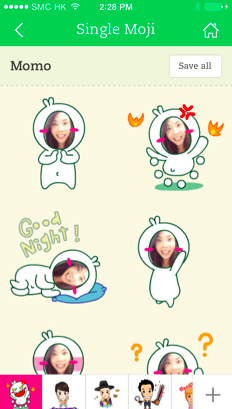 Then share your new stickers over WeChat – all for FREE. Uncontrollable laughter will be sure to ensue! 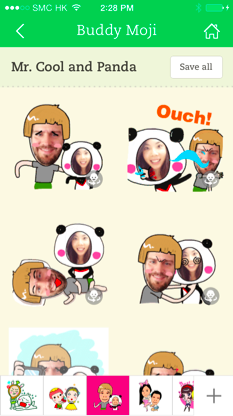 With MojiMe, you can choose to customize either single or double stickers. 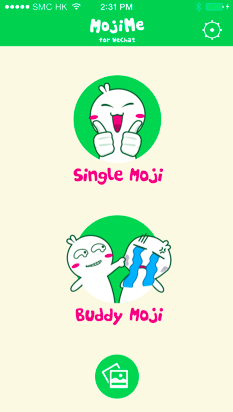 Making a buddy “Moji” is the perfect social activity to do with friends and a cute romantic gesture for your significant other. Or, wing it yourself and easily create Mojis of your own. Both options have a variety of animated character themes to choose from. For single emoji, these include Suprise, TV Drama, Horror Movies and Cute Girl. For buddy emoji, these include MoMo and Rabbit, Prince and Princess, Mr. Cool and Panda, Love Story and BFF. Users can also download even more themes from the sticker gallery by selecting the “+” icon in MojiMe with new ones constantly being added. So whatever your personality or mood may be, there is a theme to help you express it. And don’t forget to share your mobile Moji masterpieces! The app’s integration with WeChat makes it simple to share your personalized stickers to any chat conversation and on your Moments timeline. Friends can even unlock a fun game when they click your MojiMe Moments post. This dynamic game brings each sticker to life in a new Whack-A-Mole style experience where you must hit Mojis before they dissapears. So what are you waiting for? 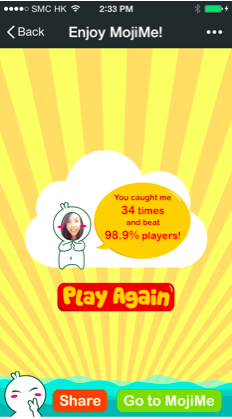 Transform yourself and friends into the next sticker sensation with MojiMe for WeChat. MojiMe is FREE to download for all iPhone and Android users in Indonesia, Malaysia, Taiwan, Singapore, Thailand, Hong Kong, India, Philippines, South Africa, Italy, China and US.